Can you Survive the Shadows Over Vathak? They worshipped, so they said, the Great Old Ones who lived ages before there were any men, and who came to the young world out of the sky. Vathak is a land of harsh terrain and frigid weather. Plague and disease have swept the land, turning cities to cemeteries. The Vampire Lords are fighting for power and survival. The vindari killed most of your family as their genocidal plans spread across nations. Bhriota cultist kidnapped, tortured, and ate the first girl you ever loved. 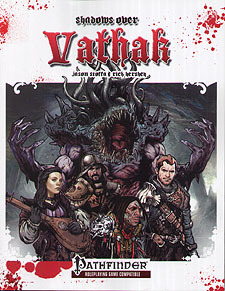 Shadows over Vathak is a dark fantasy, survival horror campaign setting for the Pathfinder Roleplaying Game. Combining elements of gothic horror and Lovecratian mythos, Shadows Over Vathak introduces a world of hardship and strife on the verge of a great war with other-worldly horrors. Complete rules for the 6 dominant races of Vathak, including their ecologies, alternative racial traits and favoured class rewards. These core races are; Bhriota, Cambion, Dhampir, Romni, Svirfneblin, an the Vindari. 5 new classes like the Apostle, Blade Slinger, Eldritch Conjurer, Rifleer and Sword Dancer! And over 20 new archetypes for all your favourite core and base classes! Over 50 new Feats and Spells for even more character options and horrific flavour. Firearms, sacrificial kits, mummified armour, war machines, and magic items to discover on your path to adventue and quest to destroy the Old Ones! Details on all the regions of the lands of Vathak, including strange locations, mysterious cities and the characters that inhabit them. Game Mastering section giving you new and streamlined rules for diseases, weather, sanity, how to build a city of Vathak, and an easy adventure generator! Horrific creatures to plague your players, including the Spawn of the Old Ones and Yshugua Titan. And a variety of creature templates to create your own unspeakable monstrosities!